The house is located at walking distance from the major Land marks in the City of Poughkeepsie. Walkway over the Hudson: Just Two minutes walk. Train Station is 3/4 Miles only. Grand Hotel is only Five minutes walk. Marist College is One mile, Vassar Hospital is 1.2 miles. Vassar College is just 2 Miles away. CIA is only 3 miles away. Historic sites, President Roosevelt Mansion, Vanderbilt Mansion and Miller house are 5 to12 miles away. All the famous Restaurants are walking distance . The most important factor which make our space most unique is, the close, proximity and accessibility to all the Major landmarks of City of Poughkeepsie in few minutes. Neelam's home is convenient to the ICA, Marist, and the FDR Museum and library. Plenty of amenities within a short drive. The house is well kept and charming, and I enjoyed the warmth and friendliness of Neelam and her husband. Neelam and Rocky were super nice and friendly people! Great hospitality. A cozy warm bedroom and delicious breakfast. Their place was very close to everything in town. Everything was clean and as described in the listing. We'll be staying here again for sure if we're in the area! My son attends school at the Culinary Institute and needed a place to stay overnight until he was allowed back in the dorms the next day. Rakesh (Rocky) agreed to let him stay the night at their home even though he was scheduled to arrive much later than they normally allow. My son managed to catch an earlier train by skipping dinner and running for it. I let Rakesh know he would arrive at a better time and that he'd skipped a meal to make it and Rakesh fed him upon arrival. They also gave him a good breakfast in the morning knowing he was going to be busy trying to move all his stuff from storage to his dorm! They are incredibly kind and go above and beyond to help. It's very gratifying to find someone that cares about your kid the way you do!! Thank you both Neelam and Rakesh!! The best Airbnb experience I have had so far. They are very welcoming and friendly. They provide all mentioned amenities and much more. Super convenient for my short trip to Poughkeepsie. Excellent hospitality! Both of them are really wonderful, caring, thoughtful, kind, and generous people which qualities are rare to find nowadays. While staying there, they showed outstanding hospitality, so that I felt like I am at my home. Each of their thoughtful touches as asking how am I doing, offering a hot beverage, sharing food with me created a warm and cozy atmosphere. Their hospitality just astonished me. The place to stay in Poughkeepsie! Neelam’s place was very clean and cozy and felt very homey. Neelam and her husband were very hospitable and friendly and made our stay so nice! They made delicious breakfast in the morning when we woke up and brought us water for the night to our room. I couldn’t ask for anything more from a very nice couple! The upstairs room is private and off set. The room has a separate entrance with a 42 inch screen tv, DVD player, and sitting area. There is also a bottle of wine and snacks waiting for you. Quiet private street close to metro north, walkway over the Hudson, serval colleges and Vassar hospital. Also close to all major shopping and sinking options in the area. Van was very accommodating and the place was very nice. Clean, convenient, and affordable, with only one minor inconvenience. I must qualify by stating that I actually spent very little time at Van's place because I was in town for a conference. I got in late and left early in the AM, so really was only there to sleep. The space and linens were very clean and the room had a very pleasant scent. The street was quiet and within easy walking distance to Downtown Poughkeepsie where I spent most of my time while in town. There was a small inconvenience at the time of check-in where I did not have the proper directions and thus had to guess which set of keys and room were mine. I did arrive 30 minute prior to the official check-in, but this was OK'd at the time of booking and reconfirmed on the morning of check-in. In the end, I unknowingly put myself in the wrong room, but this was taken care of by Van and I believe he coordinated with the other visitors to get them into a different room. Had a nice stay! It was quick-only one night for a wedding I attended but was less than 10 minutes from wedding venue. Could park off street which was nice. Mattress a little firm for me but not a huge deal. Couldn't beat the price and Van was very nice about letting me check in an hour early! Great place and had everything I needed. Van makes you feel right at home away from home. A generous and considerate host, Van's accommodations were clean, comfortable, and organized. The area is quiet and quaint. His place is about a 7 minute walk into town where you can find food and some entertainment. It is also just under a 15 minute walk from the train station. I would highly suggest driving or renting a car as cab service is not always reliable in this small town and, as of this posting, neither Uber or Lyft is operating in this area. If you need anything, don't hesitate to ask. Van was very easy to reach and communicate with. The wine and snack basket was also a nice touch! All in all the listing and photos are accurate. Van provided as described. Figuring out keys was a little annoying, but minor. The room we stayed in was on the second floor. The third floor is occupied by a long term tenant. Unfortunately we stayed on a night where our upstairs neighbor was "getting lucky" and the walls were thin. I could make out what songs were playing, how rickety our neighbors bed was, and how vocal they are while they had their fun. Unfortunately this kept me up through the night. If I were to isolate this incident from my overall experience I would say my stay was fair. I was needing to stay in Poughkeepsie for one night during my travels and I'm very thankful I stayed at Van's place. Easy to find and get in, free parking available, cozy room. He replied back to my messages quickly and promptly when I had questions. Overall great stay! You'll feel right at home in this cheery and clean little apartment tucked right in the heart of Hudson's Valley, Poughkeepsie. Our apartment is minutes away from Marist College, Vassar College and The Culinary Institute of America. My boyfriend and I had a great stay here. Van provided wine and snacks and left us clear check-in directions. This place is within walking distance of the Hudson Bridge and a fun, local brewery. We would stay here again! This is my second time staying at Van's place and it's great! It's clean, comfy and convenient. The location is residential within walking distance of restaurants and the train station. I highly recommend staying here. Consistency is very important. If I need any assistance Van is always responsive. And Van's location is always clean and quiet. And the off street parking is a plus! Great communication and lovely home, great restaurants and waterfront within walking distance. Van was great and quick to respond! Van's place is very conveniently located. He is a great communicator and always wanted to be sure everything was OK. Very clean place with a couple of other guest rooms. We shared the space with another couple which worked out very well. Also we had off street parking which is always a plus especially in the historic district where streets tend to be narrow. I would recommend this place for anyone visiting the area. My cousin and I needed a place to stay close to the train station because we were heading to NYC in the morning. It was easy to find but were unable to use the parking lot next to the building because some people didn't park as tight as they could have. We ended up parking down the street. We got in late at night but Van made it very easy to check in with very clear instructions. We never met him in person but communication through the app was always timely. There were 3 keys to get up to our room and stairs which didn't bother us. The bathroom and bedroom were very clean. We left early in the morning so we didn't get to talk to the other guests staying in the other room. We just needed a place to crash quick and shower before our train so this was perfect for our short stay. A modern studio in the heart of Poughkeepsie. A loft studio with a spiral staircase leading up to the bedroom. Our place is close to the Poughkeepsie Train Station, restaurants, shops, bars, cafe's, Walkway over the Hudson, Marist College, The Culinary Institute, Vassar Brothers Medical Center, Mid-Hudson Regional, Bardavon Opera House and the Poughkeepsie Waterfront... You’ll love our place because this will truly feel like your home away from home. You'll find a fully furnished, eclectic/vintage one bedroom apartment, fully equipped for all of your needs. We welcome everyone! This apartment has Hudson River views and is light and bright. This is the entire second floor of a 3 unit apartment building. Comfortable room with lots of natural light. Located on the first floor of a 3 bedroom apartment in a private home. The quiet neighborhood is ideal for a peaceful get away, or if you are passing through to see the beautiful Hudson Valley. The neighborhood is quiet and very clean. The area is perfect for family, dining, entertainment, or just relaxation. Tout était parfait. Nous sommes très satisfaits de notre séjour. I had a mostly quiet and comfortable stay at Van's place. I only met Van briefly after my check-in. He was very nice and made check-in/ out very easy. His place is perfect for the amount of money you have to pay. Sadly I don't like artificial scent which he uses in every room. So that was the only downside for me. Thanks for the snacks and wine! The place had everything I needed and expected. We did not interact but he was great at communicating. Second time around. Comfy, private and clean. Host is professional and accessible. Central location in Po'keepsie. Quiet area. Van is responsive and helpful. Van, Was a gracious host. Quick to reply and right on time with check in instructions. The room was clean comfortable and afforded a great stay. This modern, well-appointed apartment is centrally located and furnished with bohemian style. Use the BBQ grill to prepare a delicious dinner and enjoy it al fresco on the patio—or walk to one of the many restaurants found nearby in Little Italy. The Poughkeepsie Train Station, historic Walkway Over the Hudson, and numerous local eateries are all within walking distance from the apartment. Poughkeepsie is the gateway to the Hudson Valley, and lots of other attractions are within easy reach. Awesome, clean and stylish. Parents visiting kids at Marist, CIA or Vassar, this is the perfect stop over! Wonderful and cozy place. Easy in and out- everything you need. Great! Great stay!! Clean, convenient, a great place to rest your bones. Near everything. Robert & Regina have a great place in a great location. Very clean and very comfortable! Spotless, full kitchen, comfortable, easy parking; Regina and Robert provided helpful restaurant recommendations as well as snacks and coffee; we were just passing through, so it was great to be so close to the train station. Easy to find and provided ample accommodation for 2 people, great parking facilities and good wifi signal. Clean and tidy. An enjoyable stay! This is a comfortable and welcoming residence that is centrally located to many attractions with ease to access major routes. Robert and Regina made the trip seamless with their helpful communications. Hudson Valley is a great get away destination. This place is an absolute amazing getaway from the city for a steal of a price. Beautiful, small but not too small, close to civilization but yet comfortable and quiet. Loved this place and would definitely stay here again. Awesome home filled with love : ) Kitchen use, laundry use, pool use seasonally, private and or shared bath depending on other rentals at the time, use of yard, cable , wifi, close to colleges and all major attractions .Help yourself to our food.Cook your own breakfast too.Bikes for guest use ! Location is great! Neighborhood is wonderful! Large living room for use. Large yard in a nice family sub division. Kitchen is fully stocked with needed utensils and wares. Family oriented , tree filled, bird filled, chipmunk filled ... Nice atmosphere! But close to everything. Nice, clean, comfortable room. Super close to Marist college, so it was a convenient place for us to stay for our visit. Very quiet! Loraine was absolutely wonderful! It was a shame we arrived so late and left so early. It would have been such a pleasure to spend more time at her place. It really feels like you are in your own home when you are there. And she has everything you could possible want...from the bottles of wine for $10 in case you don't want to run to the store all the way to the incredible homemade soaps she shares with guests. Such a great place. The house is comfortable & easy. I enjoyed my stay. Lorraine is a speedy text/communicator. Clean and lots to do as far as entertainment! Loved the pool!! Very nice place, and friendly family. Thank you Loraine. My daughter and I had a wonderful stay at your lovely home! You won't be disappointed. Great and affordable hospitality. A fantastic host. Our rose colored room is bright & cheerful! KR's - Win on Whinfield. Very friendly host who is very welcoming and helpful. The bed was super comfortable, the bathroom is downstairs from the room but it is all yours -- it is small space especially the shower but I made it work fine. The neighborhood is very quiet and safe. Parking on the street was not a problem and the car and contents were all safe as well overnight. Lorna’s home feels like your home away from home. The house kab very pretty and located in very serene location. Cleanliness is upto the point and it has got all amenities.The kitchen is free to use and is really very clean. The host Lorna is really a great human being, she made my stay in Poughkeepsie like a piece of cake.. She used to drop me to my examination center and asked me if she wanted me to drive around. She helped me in making breakfast and I relished freshly brewed coffee. I recommend her house to everyone who is travelling to Poughkeepsie and looking for a cool place to stay in. Lorna's place was wonderful! The room is spacious and the bed was very comfortable. You have your own bathroom downstairs that is very clean. I was traveling alone for a workshop in the area and Lorna even made me breakfast before I left for the workshop which was much appreciated. Lorna is an excellent host. She is very hospitable and helpful. I would definitely stay again! Lorna's place is beautifully decorated, centrally located, the bed is the most comfortable bed I've ever slept on but best of all the place comes with Lorna who is so kind, considerate and accommodating. She seems to genuinely care about people and offers a warmth i have never felt in an Airbnb stay before. Dont hesitate to book your stay there! Lorna is without a doubt, the hostess with the mostest. My hours while working were such that I only saw her twice while there. I tried to be quiet and considerate of Lorna and her family ... I hope I succeeded. I would definitely recommend Lorna as a hostess. you can't beat the easy access to the highway. Lovely comfortable stay with Lorna. Super clean Big comfy bed lovely touches nice breakfast fast wi-fi hot shower all good RECOMMENDED! Lorna’s house was cozy and warm and she offered lots and lots of little touches. She picked me up from the train and made me breakfast both days. She stocked the fridge with bottled water and fruit which made my day in a conference center much better! The room is nice with great light. Everything is sparkling clean. The downstairs bathroom means trips up and down the stairs but it’s totally manageable. Only .5 m from the Poughkeepsie train station this apartment is centrally located in the Historic Hudson Valley. The Walkway Over the Hudson is close at hand granting unsurpassed views. On the opposite side of the river is the beautiful Shawangunk mountains with hiking trails at both Mohonk Preserve and Minnewaska State Park. Marist and Vassar Colleges are just 2 miles away. The Culinary Institute of America and the historic villages of Hyde Park and Rhinebeck are a short ride up Rt.9. This is a private second floor apartment so ability to walk a flight of stairs is necessary. We are centrally located in the city just a short drive to the Valley’s premier attractions. We are within walking distance of Vassar College that has wonderful arts programs, museums and the amazing Powerhouse Theater. Just walking the campus is a treat any time of year. 1889 Victorian home is located in the South Historic District of Poughkeepsie. Spacious queen guest room includes sitting area with pull out sofa, closet, dresser/mirror, rocking chair, antique desk, WiFi, TV/cable and air conditioner. Private guest bath is at the end of the hallway. Convenient to Vassar, Marist, CIA, FDR, Omega, Bardavon, Vanderbilt, Walkway over the Hudson, Metro North & Amtrak trains. Restaurants, deli, drug store, laundromat, library, bus line within walking distance. Our historically landmarked, Victorian home is located in the South Historic District of Poughkeepsie. She retains much of the Queen Anne detail including fish scale shingles, basket weave trimwork, spindle porch balusters and many colorful stained glass windows. Please be patient with our exterior appearance. She's a work in progress. We are lovingly restoring her back to her original beauty of nearly 130 years ago. The entrance displays a hand carved chestnut archway and beautiful Greek key inlaid floor. The spacious guest room, on the second floor by stairs, includes a queen sized bed, sitting area with a pull out sofa (double), a large closet, dresser and mirror, rocking chair, antique secretary desk, WiFi, TV/cable and air conditioner. The private guest bath is at the end of a short hallway. Our home is convenient to many Hudson Valley sights and attractions. One mile from Metro North & Amtrak train station, 2 miles to Vassar, 3 to Marist and within miles of the Culinary & Omega Institutes, The Roosevelt Estates, Vanderbilt & Mills Mansions, Bard, Innisfree Gardens and many other sites. We are within walking distance of the Soldier's Fountain, the Bardavon, the Adriance Library and the Walkway Over the Hudson. Wonderful restaurants are available, happy to make recommendations. A drugstore and laundromat are around the corner, bus lines are available as well as taxi service. We have 4 cats - Beau, Oreo, Houdini & Miracle. They will not be in your rooms unless you allow them. (Be prepared to give treats!) They do live in the rest of the house and enjoy their outdoor kitty habitat. Please be mindful of their safety; do not let them outside. If you have allergies or concerns about cats, this is not a good fit. If you like cats check out our photos! Our place is perfect for couples, solo adventurers, business travelers, and families (with kids, no babies or toddlers please). We are located at the cornerstone of the Historic District and the city central. Our home is convenient to many Hudson Valley sights and attractions. One mile from Metro North & Amtrak train station, 2 miles to Vassar, 3 to Marist and within miles of the Culinary & Omega Institutes, The Roosevelt Estates, Vanderbilt & Mills Mansions, Bard, Innisfree Gardens and many other sites. We are within walking distance of the Soldier's Fountain, the Bardavon, the Adriance Library and the Walkway Over the Hudson. Wonderful restaurants, antique emporiums, wine trails and drive-in movie theatres are available, happy to make recommendations. A laundromat and drug store are on the corner, bus lines are available as well as taxi service. Kim is a friendly, warm and gracious host. She was there to answer questions about the area (Hyde Park, Culinary Institute of America and Storm King) and steered us to an excellent restaurant in Poughkeepsie. We had warm scones and coffee served to us in our room. The house is one- of- kind Victorian which she is lovingly restoring. The room is large, beautifully decorated, sitting area and the bed is very comfortable. There is a basket of treats and water in the room, which adds a nice touch! We enjoyed meeting her cats as we always miss our pets when we travel. The stay at Kim's was great! Highly recommended! What a nice and interesting old Victorian home. Very tidy and lovely AirBnb equipped with everything you need. A great bed and nice bathroom. Kim was a great host with fast communication and just the most adorable family cats. She recommended dining out options and a local deli which were fabulous. Very nice and wants to share about the area. We had a great time visiting FDR estates. A nice home, coffee and scones in the AM (thank you so much!) and a super friendly Host is what we so enjoy about AirBnb. Thank you, Kim! Kim is fantastic; thoughtful, attentive, and kind. She gave us the space we wanted, and was available when we needed her. The suite was lovely with a lot of character. The homemade breakfast treats and coffee in the morning was a very welcome touch. The cats stayed mostly to themselves, but we're very cute nonetheless. Would highly recommend this house and host! Kim considered every detail and went above and beyond to make our trip easy and just lovely- unbeatable hospitality! Our room was cleaner and better kept than most hotels we've stayed in. We really enjoyed our visit. I would not recommend this home for people who dislike cats. My daughter and I were here on a college look trip and Kim's place couldn't have been more convenient. Kim was away the night we stayed but did an excellent job of facilitating getting us in and offering advice re: our stay. There were considerate snacks and coffee in the am. I'd recommend it and stay there again. Convenient location but plan on a short drive to restaurants and sights. Kim's house has a lot of character and our stay was quite comfortable. The cats and a dog she was babysitting were an added treat. Kim is a very gracious host who went out of her way to make our stay perfect. Kim is a wonderful host! She is friendly and warm and has thought of everything, whether it's info about the area or extra blankets for the bed. We enjoyed her beautiful place and meeting her and her cats! Cat lovers will be especially happy here, as well as anyone who loves Victorian homes. Our room was spacious and beautiful and we were very comfortable. The house is very close to Vassar, which was the reason for our visit, and Kim was welcoming to our college student, who came over to visit and hang out. Great Airbnb experience! Our home, your home away from home is the place that you can relax and have fun. We have the amenities that you are looking for and willing to add the things you desire to keep you coming back for more. We are a loving Host Family who looks forward to meeting new people from around the world. We look forward to welcoming you to the great Hudson valley. Our neighborhood has great Art galleries, colleges, music concerts, restaurants, wineries, culture and community centers. Many local town to explore. We are the community you want to be a part of and where you keep coming back. An amazing hostess and for that reason I have extended my stay at this lovely location. Delia charming, outgoing, helpful, reasonable, friendly, and accommodating. The hospitality is unparalleled to any place I have ever visited before. Lovely entire 3rd floor in a historic Queen Ann 1894 Victorian home with private entrance and porch. Close to the Walkway Over the Hudson, to the Dutchess/Ulster Bike Rail-Trail system, the FDR home and library, Vanderbilt estate, and many other national historic sites and outdoor adventures. Guests are welcome to enjoy the beautifully landscaped back yard. The apartment has just been renovated, is newly furnished, and features tree top views. There is a full kitchen with utensils, cookware and dishes, Keurig with coffee and tea provided. Two bedrooms, one with a new queen bed and the other with two new twin beds, both with ample closets. The bath has a classic Victorian claw foot tub/shower , the half bath is located in the ground floor apartment foyer. There is heat and central A/C. Academy St Historic District is one of 3 National Historic Districts in the City of Poughkeepsie. Most houses are grand Victorian era homes with large lots on tree lined streets. It is wonderful to stroll the area and view some amazing architectural gems. There is easy access to the Metro North Railroad and Amtrak train station, and NYS Thruway. Poughkeepsie is home to Vassar and Marist Colleges and the Culinary Institute of America (CIA), allowing for some great world class restaurants. We are within walking distance of Rite- Aide and a local deli. We are also in very close proximity to Vassar Brothers Hospital and an Urgent Care facility in the event you should require it. There are two shopping centers within a 5 minute drive of the house and we are located approximately a 1/2mile or a 4 minute drive from downtown Poughkeepsie. Mark was fantastic. Great communicator who had great insight into the local area and had great suggestions for us. At the end of the day you don't get a better operator than Mark! They went way above and beyond for our comfort and were really concerned that we had a great time. Great location, came in for a wedding at vassar. Spacious and thoughtful design. Great hospitality. Mark and Tim's private suite on the third floor of their lovely Victorian home in Poughkeepsie's historic district, is one of the nicest places you could ever choose to stay! My husband and I were delighted by the size and comfort of the light-filled space, and my husband's first comment was "this whole space is ours??" The two-bedroom apartment with sitting area, bath, full kitchen and a long hallway, feels spacious and airy. It could easily fit a small family or two couples. The decor is an impeccable mix of vintage and modern, with an amazing art collection. I wish I could buy the vintage kitchen set and the antique daybed! :) For an antique house, the systems are totally upgraded. It was hot and humid out, and we were on the 3rd floor, but the central AC worked perfectly, as did the water temp and pressure. The linens are all new, the bed was super comfy, as was the carpeting. This is just an amazing place, with 5-star hotel amenities, and bed & breakfast charm. There was a Keurig with a wide assortment of coffee and drinks, and half-and-half. Really, what more could you ever need? Oh, and I have to say I am a clean freak, and it was absolutely spotless. Don't hesitate to book a stay with Mark and Tim whenever you are in the area! Very clean and cozy space. Mark was extremely helpful throughout the Check-In process and made it super easy for our group. Very nice place. You will not be disappointed. Rooms are very roomy and tastefully decorated. Could never say enough of how nice this place is. You will never be disappointed. Definitely recommended and would come back if I was to go there. Absolutely charming apartment in this amazing Victorian home. We were able to park both of our cars off street in a very safe backyard. The apartment was sparking clean, charming and perfect for the 5 ladies staying. One and a half baths were perfect, kitchen with a Kerig (and a wonderful selection of coffes and tea), and spa quality towels. We were invited to use the backyard table and firepit to end our evening. Great location, great hosts (that provided immediate responses even when I went to the wrong house first!) We look forward to returning to Mark & Tim's place again and again. The Study is a cozy, comfortable private room in our beautiful 1868 mansion, minutes from Metro North, Amtrak, Vassar and Marist Colleges. Guests enjoy use of our living rooms, including our Chickering baby grand piano, our porches and linked back yards. Shared use of our kitchen can be arranged. Guests can walk to downtown entertainment venues, bars and bistros and there is easy driving access to local and regional historic sites, the Catskills, and Connecticut. Spacious, airy, warmly furnished home with eclectic collection of furnishings, art, and lighting. Lovely private room with a very comfortable extra large European Queen convertible bed and a large desk for work or just spreading things out. Our home is situated on an intimate cul-de-sac oasis of four historic homes, two magnificent historic public buildings, and a church. We are walking distance to the MetroNorth and Amtrak train station, City and County bus stops, the Walkway Over the Hudson, Waryas Park on the Hudson River, the Bardavon and Cunneen Hackett Theaters, The Chase music venues, several great restaurants and bars, and all government offices. Our porches and back yards are available for your enjoyment. Pina and her husband were amazing hosts! Their home is beautiful and clean, and it's a 7 minute walk from the Poughkeepsie train station -- super convenient for folks who are coming in from out of town. Pina was so warm and kind, and she went above and beyond to make sure we were comfortable. I definitely recommend staying here! Pina and her husband are kind hearted, gracious hosts that welcomed us like family. She accommodated me and my mom very last minute so we could enjoy a bike event happening in Poughkeepsie. The Victorian home is lovingly decorated with unique finds from their travels in Europe and other parts of the world. They have beautiful artwork on the walls which I liked. The breakfast next day was superb. I felt royally treated. They also gave us thoughtful recommendations on places to visit and we enjoyed our tableside conversation reminiscing about old New York. I would just note that Poughkeepsie is pretty hilly, so my 70-year old mom had a challenge walking around, but that's not a reflection of the hospitality I experienced from Pina and her husband. We plan to return to see more of Hudson Valley and will be sure to stay with them again! Thank you so much for your kindness and generosity. Great location for Poughkeepsie "old town" and "little Italy". Good breakfast, comfortable house. Hosts helpful but not intrusive. Our hosts Pina and Daniel were absolutely amazing. They made us feel extremely welcome and right at home with their warm, loving and hospitable kindness. We adore both of them and feel like we have a second home in Poughkeepsie! Our trip could not have been any better and I attribute alot of that to Pina and Daniel. Much gratitude to both of them! The location was perfect with easy walking distance to downtown; either direction brought you to restaurants, coffee shops or the amazing Hudson River. They were also very helpful with ideas and suggestions about what to do. We would definitely stay here again! Pina is very welcoming and accommodating. She truly hosts her guests, sharing food, cocktails, and conversation. Staying with Pina is like staying with family. Pina and Daniel were lovely hosts. Pina was great with correspondence. They had great suggestions about restaurants other places to see. They were very welcoming and their home is lovely. Lovely house and space. Pina and her husband were very nice and accommodating. Centrally located with great access to the train and nearby restaurants. Would definitely recommend staying here. In addition to finding a place in our hearts for Poughkeepsie and its many hidden gems, we left with new incredible friends in Pina and Daniel. Their home is beautiful and welcoming, a direct reflection of The wonderful couple. An incredibly generous, creative, and fun team whom offered themselves as friends, guides, and historians, and gave us our space as needed. They are very knowledgeable about Poughkeepsie, and really helped us to make the most of our trip. I must point out, that generally we prefer to find a place of our own through AirBnB, but I am so pleased and grateful that our paths have crossed and we chose to stay with them instead. Will return to Poughkeepsie, and will absolutely stay with our new friends each time. It is with high regard that I recommend their AirBnB services. Thank you Pina and Daniel. The burgundy couch .The benefit of the downstairs of my house and my yard.Not a bed it's a couch. Great place to stop while traveling. Loraine's couch fit the bill for the one night stay I had. very nice home that I had all to myself for most of evening. easy check in and directions for everything made for relaxed stay Thanks Loraine! Just like Loraine (Website hidden by Airbnb) is a "clean hostel". She is an excellent host who opens her home up completely to you and has clear directions all over the house. If you're all about conversation and a friendly atmosphere, this hostel is for you! Thanks again Loraine! One of the best airbnb experiences in Hyde Park! Wow! What a great experience. Loraine has really gotten into this and makes sure that you are comfortable and has directions all over the house. Don't let the sunglasses intimidate you. Much more than I expected. I arrived after dark to a neighborhood where I felt very safe. Lorraine showed me around, introduced me to another guest and I swam in the pool--my fav part!! Lorraine is Trusting and friendly, a perfect hostess. Highly recommend this place. My room was very clean, comfortable w great wi-fi and my own TV, bathroom down the hall. Full Blue moon out my window--a bonus!! My wife and I were so happy to spend this weekend with Loraine and Paul. They were warm, welcoming, and very accommodating. We had great time talking on the back patio, talking, and enjoying their beautiful backyard. We were truly treated like family. Should we ever find ourselves in Poughkeepsie again (and I hope we do - it's a lovely place) we'll be staying here again. Thanks Loraine! My living room couches and floor. Delia is a lovely hostess, her rooms are well maintained and she's very accommodating as well. You can expect some nice breakfasts and a nice dog to greet you every morning. It was great staying here. Charming, on the corner of a busy area in the middle of Poughkeepsie and blocks away from a nice brasserie that's a copy of Balthazar (but smaller) and around the corner from Bardavan where they have amazing shows. Fantastic host! Delia is a thoughtful and kind host, and the home is beautiful. Must stay!! Delia really puts her heart and soul into her home. We felt so welcome and accommodated for especially after a long day hiking. She provides plenty of little touches to help make the stay comfortable and we felt we could always ask her for anything we needed. Great place to stay! Bed is comfortable and Delia is doing everything to make sure you have everything you need. Highly recommended! Delia is amazing. Her house is spotless and feels like home. She’s on top of every possible outcome and put so much thought into every aspect of her home. Incredible stay!! The room was very comfortable and clean. Having a loft twin bed in addition to a queen bed in the room was perfect for us. Delia was so nice and did everything she could to make us feel at home in her house. The location was super convenient for the entire area. I would definitely stay here the next time I plan a trip to Poughkeepsie. Totally renovated home conviently located near by train station, Marist College, Vassar College, Culinary Institute of America, FDR Library, Walkway over the Hudson. My home is a 2 story home built in 1856; it has one bedroom and full bathroom on each floor. We refinsihed 9 in pine wood floor trying to keep most of yesterday in the house. Brand new kitchen is fully equipped with snacks and coffee, tea! Theres 2 parking spaces next to the house and yard will be fenced in when Spring comes! Its a 1856 old style home and theres one bedroom and full bathroom on each floor. Kitchen is brand new fully equipped with filtered water for modern convience (dishwasher). Laundry unit is located on 2nd floor with inside the bathroom. I can't say enough good things about John's home. It was amazing and had everything you could ever need. It was extremely clean and well designed and came fully stocked with tons of snacks. Additionally, communicating with John was very easy; he was always quick to respond to messages. Overall, great value for the price. We had a fantastic stay here and would definitely recommend the place to anyone in the future. Very clean and comfortable. Rented with another couple as we attending a HS reunion. It was fun to return to Poughkeepsie and be in walking distance to cool rehab'd neighborhood, little Italy, Walkway, etc. We enjoyed our stay. The house was clean, comfortable and within walking distance of the waterfront, the Hudson River Walkway and Little Italy.. The drinks and snacks were a nice touch. You will love this beautifully renovated and decorated space. The hosts have thought of everything! You have a full kitchen with everything you need to whip up any meal and the beds were comfortable. The bathrooms were well stocked and sparkling clean. Easy to get to, check in was a breeze and it’s a great neighborhood. Safe and easy parking, John is the perfect host. Perfect family home and a great value! John’s home is absolutely beautiful. Entry and exit was a breeze. Cynthia and John were super responsive with questions. Couldn’t have asked for a better experience. John’s house was much nicer than we were expecting. It was beautiful and well laid out and immaculately clean. There is a nice deck in the rear that is accessible from the outside and the first floor bedroom. The kitchen was extremely well stocked with appliances and food. We would stay again in a heartbeat. I wish we would have had more time to stay. It was an overnight trip to visit the CIA and Roosevelt Home. This house has been lovingly set up for guests. Clean and comfortable furnishings, super comfortable beds, a wonderful kitchen with everything you could need. They even included soft drinks in the refrigerator, snacks, coffee, and easy breakfast things. The CIA and Roosevelt home were minutes away and easy to get to. I hadn't planned on the snow, so we didn't take advantage of some of the other things in the area. Not much to do in the neighborhood itself, though. One of the best Hudson Valley kept secret. Welcome, the Alexandria Clinton House, a beautiful experience awaits you. Your separate apartment on-site which offers a private entrance and adequate space for small groups and families of 6, open living room full sleeper couch and separate converted sleeping area. It's an ideal location for a family as well as a romantic getaway. One private bedroom. Inviting porches, outdoor living with fire pit, gardens to lounge about. Bathroom through the bedroom. Located in Poughkeepsie, New York, The Alexandria Clinton House is minutes away from the train station, and 40 minutes from Stewart Airport. Just blocks from waterfront, shopping and dining in Poughkeepsie, NY, the best of Hudson Valley. Centrally located Hudson Valley Parks, Rail Trails, Wineries, Mansions, and Colleges. Easy day trips to historic sites, cultural venues, educational institutions, culinary destinations, craft beverage tours, and four-season recreation. Beautiful historic house in Poughkeepsie Central area, with Marble fire place ( decorative only, electric fire place is provide) and private patio. Poughkeepsie is one of the up and coming Hudson Valley old glory town with beautiful landscape and historic houses and churches. Come and enjoy the sound of old church bells and birds early mornings, view of millennial trees and the Walkway Over the Hudson State Historic Park. One large private room with a sun room and a private entrance. Please know that there are other tenants in the house and you will be sharing common areas with them. Because it’s an active house with people living inside, common areas will not be untouched pristine. All common areas and room will be cleaned by the housekeeper just day before you arrival which is covered by your cleaning fee. During your stay your are responsible cleaning up all common areas after using them. These are the house rules that everyone must follow. Your room has a separate back entres and has a bolt lock on both doors. Guest must bring his/her own shampoo and soap and towels. Delia and her daughters were such lovely hosts! My family and I had to get ready for a wedding and it was like they had somehow intuited every little thing we might need. The house is gorgeous, and it was so nice to have so many sweet extras. Brandy the Dachshund was also a big hit! Delia's place was amazing. From an initial pleasent greeting and tour of the place to a variety of amenities, Delia provided us with an amazing experience. Our room was stocked with extra toiletries, a TV w/ streaming services, linens, and even some snacks/ drinks. Upon hearing that we would like to go to the grocery store, Delia gave us a ride and took time out of her day to give us a local's tour of Poughkeepsie! The house is in comfortable walking distance to Central Poughkeepsie with a number of different restaurants of pretty much every style. In the morning, Delia offered a continental breakfast to us, and snacks were stocked throughout the house if we became hungry at anytime. Our amazing visit was finished off as Delia offered us a care package to go and even drove us to the Walkway over the Hudson! The level of care that Delia provides in beyond incredible and is apparent from her rapid responses to the effort she puts in her interior and exterior decorations. This was practically a home away from home, there is nothing more I could have asked for. We enjoyed our stay at Delia’s. Our room was super clean, there were a ton of helpful touches and amenities, and we were close to the Bardavon, which was our reason for traveling. I also booked last minute and Delia was amazing at quick communication and being available for when we checked in. Thanks so much! Delia was a fantastic hostess. She met us with her 2 lovely daughters who were gracious, charming and helpful. She was hugely accommodating with rapid communications and beyond the call of duty support and responsiveness as our plans changed significantly due to circumstances on my end. The house is large and full of charm. Delia's attention to detail was impeccable: cucumber water on tap, a bottle of wine in the room to welcome the guest, a bundle of offerings including everything from iron/board, toothpaste/tissues to nappies and a laundry bin as well as a nightlight at the footboard for guidance to the bathroom and space on the desk for us to work on our computers or write a note to her in the Guest book her children had decorated and encouraged visitors to write in. The breakfast was set out early and beautifully on her large wooden oak sideboard and table and included a full range of fresh fruit, croissants/bread, bagels and cream cheese as well as coffee, tea, fruit juice. The house was spotlessly clean and felt like a second home to us adorned with photos of her family and her daughter's merit awards, china tea sets, comfy sofa and chairs, flowers. It was also a delight to experience many of the original architectural details in her Victorian home in this part of upstate New York near the Hudson River. It was cozy with painted detail on the wooden stair steps and decorated with an inviting, warm feeling. You feel as if you're in a loving home. I stopped over on a long road trip with my 2 daughters and we found it a welcome respite from hotel rooms and a long spell in the car. My 2 girls (12 & 15 years old) curled up and watched a movie with Delia's daughters (similar ages) on the sofa. Hard to beat that. I was eager to visit some of the local tourist spots that Delia told us about in Poughkeepsie,....but sadly had to carry on. Another time. Delia's house is lovely, clean, comfortable, and well-appointed. She went above-and-beyond with sorts of special touches and amenities, and made us feel more than welcome. (We ended up sleeping in about 2 hours later than usual because we were so comfortable!) A hearty continental breakfast in the morning was an added treat! We look forward to visiting again. Delia's house is lovely and her hospitality was outstanding. She truly thought of everything, including ear plugs for this light sleeper! She also had a lovely continental breakfast spread which was unexpected and very much appreciated. We were just passing through, so just stayed the night, but would certainly stay again if we find ourselves in the area. Welcome to Gray's on Fulton! We're conveniently located less than .5mi from Marist College and Mid-Hudson Regional Hospital and a short 8 minute drive to Vassar College and the Culinary Institute of America. Whether you're a parent visiting your college student for the weekend, spending time with someone at the hospital, or in town to enjoy the picturesque Hudson Valley, you've come to the right home! Gray's on Fulton is conveniently located in the Fairview neighborhood of Poughkeepsie, NY. Fulton Street is a popular street where both families as well as college students both reside. Our home is located near the top of the street on .5 acres surrounded by quiet, beautiful trees, and sunshine. Within 5 miles, there is the Fairview Fire Dept, the Town of Poughkeepsie Police Dept, Mid-Hudson Regional Medical Center, and Metro North & Amtrack train stations. Also, a short scenic drive to the Taconic State Parkway and Interstate 84. Very comfortable home with great amenities! Amy was super quick to reply, we would definetly stay here again! We stayed at Amy and Lloyd's one night. It was very clean and comfortable. Plenty of room for my family of 5. We would recommend staying here. Amy and Lloyd's home is beautiful, clean and conveniently located. We were there to see the basketball games at Vassar and this was a great alternative for a large group. The house is extremely clean, beautifully decorated and comfortable. I would definitely stay there again. As a first time AirB&B user, I was skeptical. However the home we rented in Poughkeepsie was so impressive that we would definitely rent their home and use AirB&B service again. Pictures were accurate, home was immaculate, well decorated and peaceful. Refrigerator, Kitchen cabinets, bedrooms and bathrooms had helpful bits and pieces for our convenience and the surrounding area was safe and quiet and welcoming. It was excellent for our girls weekend to destress and bond. Fantastic all around. Thank you. Lovely place and decor. Clean and neat. Gracious hosts. Enjoy a private getaway in the heart of the Historic Hudson Valley. This tastefully-appointed guest house apartment features beautiful natural light, a spacious eat-in kitchen, and easy access to The Catskills, Beacon, Hudson and Rhinebeck. POUGHKEEPSIE: Home to 4 colleges (Vassar, Marist, Dutchess Community & The Culinary Institute of America in Hyde Park), Poughkeepsie is both a college town and a city in transition with a diverse blue collar urban community. With close proximity to restaurants and cultural destinations, Poughkeepsie allows you to experience the conveniences of “small city” life while only being a 10 minute drive from the country. A historic industrial port city, Poughkeepsie is currently going through an exciting resurgence, characterized by a grassroots local food movement, farm-to-table restaurants, and a number of revitalization projects, including the renowned Walkway Over the Hudson, the world’s longest pedestrian bridge spanning the width of Hudson River. The Walkway connects the Dutchess County and Ulster County rail trails, making Poughkeepsie a destination for bike enthusiasts. Vassar College and the city’s south side also make for wonderful bike routes with cute residential streets, historic homes, and lots of trees. We love Poughkeepsie for its diversity – its people, its culture – and the way it encompasses the full socio-economic spectrum, from its pristine college campuses to the developing commercial zone and restaurant scene in the historic main street corridor. Poughkeepsie is an exciting place with a unique energy, and an ideal home base for experiencing the rest of the Historic Hudson Valley. THE NEIGHBORHOOD: Gray Street, where the guest house is located, is a residential, tree-lined street in a transitioning neighborhood 5 minutes from Vassar College. The neighborhood is a blend of everything from young entrepreneurs, academics, government workers, tradespeople and low income families. The guest house sits across from Forbus Butternut Park, a 1-acre greenspace overseen by a local non-profit. There is a church on the other side of the park, and the Poughkeepsie High School and football field is about 2 blocks away. During the day, kids sometimes play in the street, but for the most part it's very quiet since Gray Street isn’t a major thoroughfare. AROUND THE REGION: Because Poughkeepsie is centrally located, it makes for a great jumping off point to explore the rest of the Hudson Valley region. Towns like Beacon, New Paltz, Rosendale, Millbrook, Hyde Park and Rhinebeck are all within an easy drive with lots of things to see along the way. Hudson, The Catskills, Cold Spring, Phoenicia and the Berkshires all make for wonderful day trips – full of meandering country drives, antiquing, hiking, fishing, wine-tasting, museum-hopping, or cooling off in a swimming hole. I run a blog that’s dedicated to travel, food and culture in the region called An Upstate of Mind, and I’m happy to send along recommendations for our favorite spots tailored around whatever you like to do. The surrounding Upstate NY towns are lovely, but to make for a full day, it’s sometimes good to combine a few destinations into a “mini road trip” that lets you soak in the local flavor and experience the sprawling natural settings the Hudson Valley is known for. We had a great time in Poughkeepsie for my brother's graduation. We rented a house that had been built into two apartments from Seth and it was perfect for our group- easy to find and decorated very nicely. We were a 5-10 minute car ride from everything so the location was convenient. 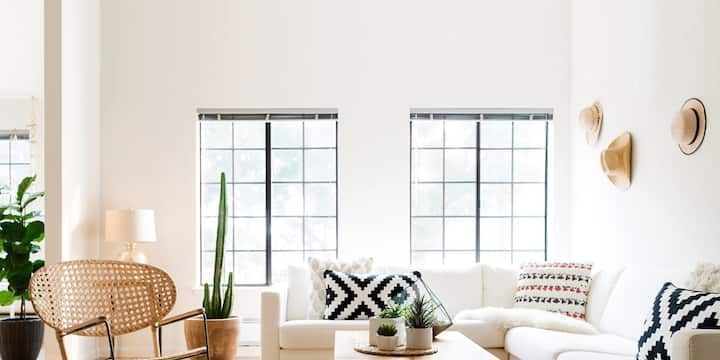 Lots of beautiful natural light and minimalist decorations make the home a great place to find soothing respite. Seth gave detailed information to make my stay more enjoyable. House is on a quiet street near a high school. The first floor apartment was clean, roomy and well appointed. I definitely recommend it - especially for business travelers who are tired of hotels. What a great place to stay! The apartment was clean and comfortable. I loved the pictures throughout the house. I wish I was able to get the story behind them all. Alex's for breakfast was a great tip! Thanks, Seth! My boyfriend and I had a great stay here. Seth was an amazing host - very responsive and gave tons of recommendations for things to do, places to eat in the area. The guest house was clean, bright, tidy, and exactly as pictured. The tasteful decor was unique and made it a special experience to stay here. The art work was a bonus! The location is perfect for exploring the Hudson Valley. We drove up to the Catskills and also checked out nearby towns such as New Paltz and Beacon. My family and I had a lovely stay here. The house was well-designed and very clean. It was quite charming, as advertised. We loved all the furniture and fixtures...we can tell that a lot of work and personal touches were put into this house. The location was also convenient for us as it was within walking distance to Vassar and close to downtown. The neighborhood was quiet and quaint. Seth and Erin were also nice, available and accommodating. Great home & great host! Seth was immensely helpful with suggestions and tips about what to do in the area and other nearby towns. Apartment was perfect for a long weekend! Wonderful apartment. Spacious, very clean, well-designed and perfect for our weekend stay in the area. Highly recommend! In a private home, this bedroom has a flat screen tv with a DVD player. It is near the kitchen where there are complimentary snacks, coffee, tea, and water for guests. It's very quiet and family friendly. The neighbors promote safety while observing privacy. The location was a good location if you are looking to explore the area of Poughkeepsie and Marist. The place had some amenities and also was generally pretty clean. Overall, I had a good experience and stay. Van is an absolutely wonderful host! He even gave us snacks and delicious wine to boot! We initially couldn't find the keys since the mailbox was behind the front door. I texted Van and he immediately drove over within minutes to help. The room is very clean and as described. We stayed the night here for a century ride event in Poughkeepsie and Van helped us find a place to store our bikes inside. The location is about 9' bike ride from the train station. If we're in town again, we'd definitely try to book this place. Very convenient to The Grandview, other guests were courteous, clean and comfortable. Van is a great host and the room was very clean and inviting. Would recommend staying in one of Van's rooms. Staying at Van's apartment was exactly what I needed. The room and living area was very clean and pleasant. He was communicative, responsive. It was a good experience. I'd stay here again. House was very clean and homey. Van was very flexible and accommodating to our group. I would go back to Van again if I needed a place to stay in the area. Professional throughout. Van's place has a convenient location & reasonable price. It was warm. I will be visiting again. At the foot of the walkway across the Hudson, this turn of the century home has original molding, doors and charm but completely updated with new hardwood floors, appliances, plumbing and heating. A perfect stay in the Hudson Valley! Walkway over the Hudson, CIA, St Francis, Marist! Quiet neighborhood centrally located 5 minutes from Marist, CIA, Vassar, and route 9. Top selections of restaurants in the area to choose. Newly renovated 3br home. Cozy w lots of character. Private parking for guests. Enjoy the very best of the Hudson Valley, and feel at home doing so. It is quiet and clean. There is also a ceiling fan in each room with original hard wood flooring. Lots of character throughout. Modern appliances, toiletries, and basic everyday living essentials provided. To express our appreciation for choosing our home, a bottle of wine is provided for our guests. The kitchen, bathroom, and living area are all shared spaces. Enjoy! Our home is quiet and yet close to everything, i.e...restaurants, theater, colleges, hospital, and shopping mall. Ideal location for great dining, family entertainment as well as local pubs. The home is on a quiet street near Vassar Hospital in the historic district of Poughkeepsie. It is also within 10 minutes driving distance to FDR and the Vanderbilt Estate, which are both excellent for picnics and walks/tours of the property. The home is with a 5 minute WALK to the Metro North train station, Mid Hudson Civic Center, and Walkway over the Hudson. Van was super nice during the process, and I was very impressed with the amenities provided. The location was extremely convenient for where I needed to go during my stay. We had a nice stay at Van's place. It was incredibly warm out so the in-window AC unit was much appreciated. Super close to downtown and the river, simple but nice spot. The room is much nicer, cleaner and brighter than the pictures show. It is a 7-minute walk to the train station and a few minutes to get to Main Street, downtown. Poughkeepsie is a beautiful place. The check-in was fast and smooth, the room was large but because there were other guests, the kitchen was a bit messy, so I didn't use the amenities in the kitchen. Wifi was good though. Simple and cosy, nothing fancy. Room was just as pictured. We were only there for 1 night so didn't meet Van. Very accommodating for a change to check-in time. Simple, clean, quiet. Van is super friendly and welcoming. I think he is an amazing host. He made sure had what i needed. The place was clean. It is very close to every thing u need. Good and timely feedback to all questions made this an easy visit. This listing has shared bath and kitchen, but we did not nee the kitchen. A/C in the window was appreciated and worked well. Price is favorable for location and more than basic amenities. Awesome home filled with love : ) Kitchen use, laundry use, pool use seasonally, private and or shared bath depending on other rentals at the time, use of yard, cable , wifi, close to colleges and all major transportation. Help yourself to our food.Cook your own breakfast too.Bikes for guests use. The entire house is slowly going thru a refreshing room by room. Some room colors and decor will vary during the process. I was totally pleased with my experience. The service lends a personal touch to the hospitality industry. My experience with Lorraine was satisfying. Her home is warm, cozy and comfortable. I felt like I was staying home away from home. This was my first time using this service; therefore I didn't know what to expect. I'm happy to say I'll be back one day- those cookies, the full fridge, the wine options the coffee the homely ambiance!!!!!! I'm a fan. I had a wonderful stay in Poughkeepsie, thanks to Loraine, she is a great hostess. Room was exactly as described. Pool was amazing since it was in the mid 90's when I stayed. she also has bikes and I used one to tour the city. Thanks again for a wonderful stay! Loraine's home was clean, comfortable and welcoming. She offered coffee and tea and fruit. The bedroom and bathroom were clean, comfortable and relaxing. Loraine and Paul have a very nice and welcoming home. I didn't get to meet them but Loraine checked in with me to make sure everything was ok and seems like a lovely person. My room was very comfortable and the house has everything you could need. Overall I had a positive experience and would stay here again when I visit my niece at Vassar. What a fabulous stay! No detail is overlooked in this charming home, sprinkled with little notes to guests that make you feel comfortable, surrounded by family photos that help you feel at ease and comfy touches that let you unwind after a long day. I will definitely be back! Thank you Loraine! Great place in a central location for stays in the Poughkeepsie area. The house also has posted instructions and detailed conveniences all over. The owners are very proud of the property and ensure that guests are comfortably situated. Poughkeepsie was a great surprise to me, nice town! Loraine's place was perfect for relaxing! Our burgundy room is cozy ! Our place is close to the Poughkeepsie Train Station, restaurants, shops, bars, cafe's, Walkway over the Hudson, Marist College, The Culinary Institute, Vassar Brothers Medical Center, Mid-Hudson Regional, Bardavon Opera House and the Poughkeepsie Waterfront... You’ll love our place because this will truly feel like your home away from home. You'll find a fully furnished, art deco/mid-century modern one bedroom apartment, fully equipped for all of your needs. We welcome everyone! We are conveniently located within a 10 minute WALK from the Poughkeepsie Train Station and the historic Walkway over the Hudson! Our three family home is nestled in the Little Italy district of the City of Poughkeepsie - Appropriately there is no shortage of Italian bakeries or Italian restaurants in our neighborhood! Four restaurants (Amici's, Milanese, Cosimo's and Emiliano's) and two bakeries (La Deliziosa and Cafe Aurora) to be exact, all within WALKING distance! Good food is definitely not hard to come by in our neck of the woods. WALK on down to the Poughkeepsie waterfront... Dine inside or al fresco overlooking the beautiful Hudson River at the River Station Restaurant. Make sure you try one of the five delicious soups, homemade daily or pop into the historic Ice House on the Hudson for some of their yummy eats! Maybe you're just in the mood to cozy up next to a fire and enjoy a delicious glass of wine? Well then WALK down the street and around the corner to the Nic'L Inn. The ambience and artfully crafted menu never disappoints but be careful because their complimentary fried spaghetti can be addictive. Obviously we enjoy introducing people to our favorite neighborhood spots but lets not take away the fact that your journey to Poughkeepsie is just the gateway to the Hudson Valley. Located within 20 +/- minutes to the Village of New Paltz, Rhinebeck, Beacon, Breakneck Ridge (Hiking), Millbrook and multiple Breweries, Wineries, Distilleries, Orchards and attractions in Historic Hyde Park. No matter the season, no matter the reason, our home is a great place to begin your journey.! It was a great affordable place to stay. Tolle Ferienwohnung, super Ausstattung, klare Empfehlung. We've had our eye on this Airbnb for a while, but it's always been booked, which only sparking our interest even more! So finally we had our chance. Located in a nice, quiet residential neighborhood in the City of Poughkeepsie. Close to restaurants, short drive to shopping, and easy to get to all the sights - Walkway Over The Hudson, Dutchess Railtrail, hiking in the Shawangunk Mountains and beyond. Nice and cozy - open living area with a big, comfy couch, counter space for 2 to eat, and a nice kitchen stocked with the basic amenities. Perfect bedroom with attached bathroom. The bed is amazing! Everything you need. We'll definitely stay again! Lovely little place - very convenient for our stay (we were taking a weekend course at the Culinary Institute and just needed somewhere to crash). Would recommend if you plan to be exploring the area - probably not the right choice if you intend to stay in. It's not quite spacious enough to spend hours and hours. Excellent stay. Would definitely recommend to others! Lovely place to stay in Poughkeepsie. Despite the snow outside the unit was warm and cozy. Robert and Regina were available for questions and quick to communicate. We can recommend this. Great space - appears exactly like the pictures. The space was clean, and as pictured. Bed was very comfy. Check in was simple and timely. Awesome home filled with love : ) ! Kitchen use, laundry use, pool use seasonally, private and or shared bath depending on other rentals at the time, use of yard, cable , wifi, close to colleges and all major transportation. Help yourself to our food . Cook your own breakfast too.Bikes for guest use. Lorraine and Paul were the ideal AirBnB hosts. Their place was clean, comfortable, attractive and luxuriously laid back. As long time owners of customer-driven businesses, they are in touch with what will put the customer at ease. They truly offer the perfect "home away from home" experience. After touring FDR and Eleanor Roosevelt's homes all day, I'd look forward to sitting by the poolside in the perfect outdoor " living room." They'd always have delicious appetizers, and even dinner set out- completely above and beyond anyone's expectations. I met such interesting guests there and had enlightening and entertaining conversations at every meal. Lorraine had just bought bicycles and a Dutch couple enjoyed those immensely, biking along the river. Lorraine and Paul's place is easy to find and centrally located; by car it is 5 minutes from the Roosevelt and Vanderbilt homes, the Culinary Institute, a famous walking/biking bridge that goes over the Hudson and the Omega Institute I believe. If Lorraine is around she may be able to pick up or drop you off somewhere. Their home is close the train station as well. Enjoy!! I'm going back. Staying with Lorraine and her family was very nice. Their home is very inviting, clean, convenient, and accurately reflected the listing. Her messages were very responsive and made my arrival super easy. It was a nice overnight stay. Thank you. This was my best Airbnb experience yet. Loraine and her family made us feel right at home. The backyard was great to hang out in even though the pool might have been a little to cool to swim in. I would highly recommend staying with Loraine if you're looking to visit Poughkeepsie. My son stayed here for an extended period while he looked for an apartment near his college. The room was comfortable and clean and everyone he met was friendly and kind. Much better than staying at an impersonal hotel! I would definitely recommend to others. This will be our top choice when we need somewhere to stay when we come back to visit. Loraine was a wonderful host. She was extremely communicative throughout our stay and made sure we felt extremely comfortable in her house. Thank you, Loraine! I absolutely love staying with Loraine and Paul! They are easily the best AirBNB hosts I have ever encountered. Friendly and sociable, they're also happy to give you your space and privacy if you want it. I've stayed with them twice before in the burgundy/wine room. I loved the ambiance of that room but really like the extra space in this room. If you're planning a long stay with them, this room would be the way to go. Can't wait to visit them again soon! Listing accurate, neighborhood safe and nice. The little signs everywhere helped everyone feel welcome and comfortable. Good location for exploring the mid-Hudson valley. Lorraine was sweet and helpful and a pleasure to meet. Amazing spot and the pool was awesome!